Toronto’s newest hotspot on the waterfront is a „sweet” beach resort named Sugar Beach, one of the first park spaces to open as part of the ambitious waterfront redevelopment masterplan. The idea was to transform a parking lot into an urban beach. On the lake Ontario, across the slip from the Redpath Sugar Factory, the 8,500 square metre park was officially opened to the large public in August 2010 after only nine months of construction. 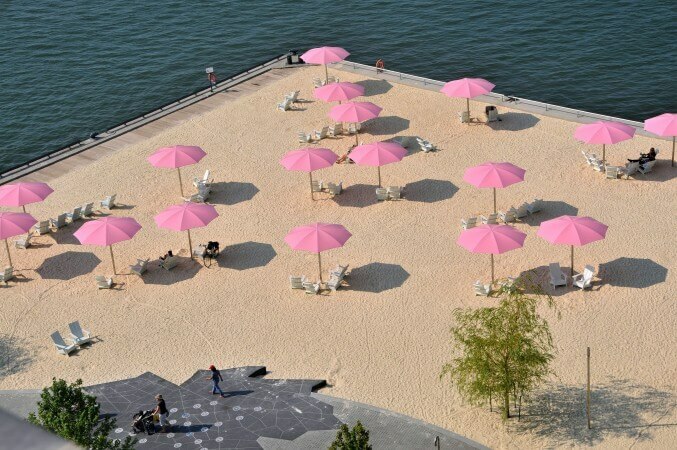 Designed by Montreal landscape architect Claude Cormier, Sugar Beach is the second urban beach to see in downtown Toronto, Canada. As you cand see from the pictures, it’s a playful landscape, a site filled with life previously known for its industrial desolation. In 2007, Waterfront Toronto launched another international competition by invitation for the development of a public space. Claude Cormier and his team won, and three years later, Sugar Beach was born. Sugar Beach is unlike anything else in Toronto. The new facility draws crowds, playing perfectly the role of social mediator and catalyst life. The park features three distinct components – an urban beach, a plaza space, and a tree-lined promenade running diagonally through the park. The beach is covered with a thick layer of white and crystalline sand like granulated sugar, a paved plaza and a diagonal promenade bordered by maple trees, separating the beach and plaza. The beach is dotted with umbrellas in the pink shade of cotton candy. The wooden lounge chairs sheltered underneath them are painted white, alluding to the Fifties aesthetic. At the sand’s edge, a series of splash fountains springing up from a large, paved maple leaf offer an alternative to lake bathing. Canada’s Sugar Beach promenade and plaza have also been designed to be fully accessible to people with disabilitiies. The Sugar factory creates a surreal industrial backdrop, where gantry cranes offload mountains of sandy raw sugar from giant tankers moored in the slip. The future of Toronto and its waterfront have never looked sweeter without this best makeout spots that it’s a relevant example of urban transformations in the 21st century, which typically use nature to recreate the harmony of the pre-modern city, while celebrating in the same time its industrial heritage. Landscape architecture: Claude Cormier +Associes Inc.